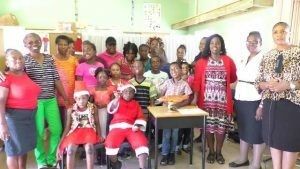 NIA CHARLESTOWN NEVIS (December 29, 2017) — The Cecele Browne Integrated School (CBIS) is the winner of the Ministry of Tourism’s 2018 Calendar Competition. 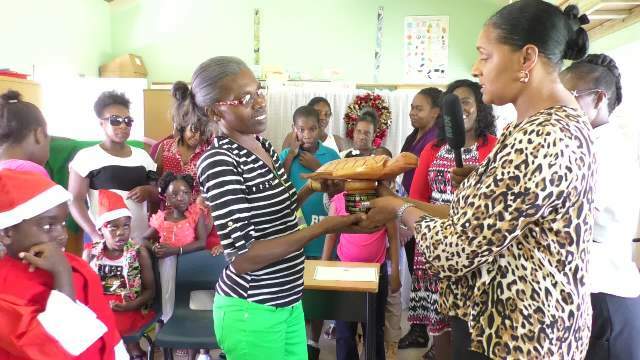 At a recently held ceremony to present the school with its award, Shelagh James, Communications Officer in the Ministry of Tourism, described the accomplishment as an incredible one. This school didn’t even stop at seven, this year, for the 2018 calendar completion, you’ve won all 12 pages. Isn’t that fantastic? That’s an incredible achievement,” she said. The school was awarded with a trophy and a Certificate of Achievement. In response, Mrs. Jennifer Liburd, a teacher who is a part of the school’s creative team thanked the Ministry of Tourism. She said they are all looking forward to 2018 as long as life lasts. As part of its winnings, the School is responsible for selling 900 copies of the calendar and the proceeds will go to the school. Mrs. Liburd, used the opportunity to solicit the public’s support in purchasing the calendars and to support for the school. Meantime, Mrs. Ilena Mills, Education Officer in the Department of Education who has responsibility for the school, commended the students for their effort. “So congratulations to Cecele Browne Integrated for winning this year. Your photos in the calendar are remarkable, very remarkable and I want to encourage you to continue to work together. Keep up the good work,” she said.